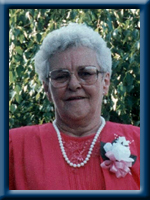 Whynot, Ethel May, 86, of Liverpool, passed away on Tuesday, January 7th, 2014, surrounded by her loving family. Born on Port Mouton Island, she was a daughter of the late Everett and Althia (McLeod) Roy. Ethel was a loving wife, mother, grandmother, great-grandmother and sister. Over the years she worked at the Best Yeast Plant, Transcotia Restaurant and Faye’s Nursing Home. She enjoyed knitting, lexicon puzzles and playing bingo. She is survived by daughters Thelma (Wade) MacLeod, of Liverpool, Phyllis (Randall) Weagle, of South Brookfield; sons Larry (Cherry), of Liverpool, Cory (Vanessa), of Port Mouton; daughter-in-law Merla Whynot, of Liverpool; 13 grandchildren; 9 great-grandchildren. She was predeceased by her loving husband Maurice; sons Ricky, Tony; sisters Evelyn, Marion; brothers Willis, Angus and Ross. So very , very sorry to hear of Ethel’s passing. She was a lovely lady,Thinking of you all at this difficult time. my great aunt ethel was a a great lady.i never saw much of her as an adult but always enjoyed visiting her with my parents when I was a child.she was always smiling and so sweet.im sad to hear of her passing.rest peacefully.we will miss you but never will be forgotten.thanks for the good childhood memories. So sorry to hear of the passing of your Loved one…Our Sincerest Condolences…Thinking of you all at this very difficult time…. It is with sadness to hear of lossing an aunt who was like a second mother to me. At a times in her life she was a mother to many who needed a place to live at difficult times.Ethel had a heart of pure gold and I will remember her forever for her kindness. God bless you as you rest with Maurice, Ricky and Tony. May You Find Comfort In Each Other Through This Sad Time. To Thelma and Family . So sorry to hear that your Mom passed away . She was a lovely caring lady . always so polite whenever I saw her . My thoughts are with you and your family .Sincerely Brenda Lawrence . So sorry to hear the passing of your loved one. Ethel was a great lady she will be missed by many…. Cheerish all the memories close to your hearts….. Hugs…..
My condolences to all the family members. So sorry to hear of your loss. My thoughts are with you at this sad time. Thinking of all the family with heartfelt sympathy at this very sad time. To all of the Family, I am so sorry to read this obituary, Ethel was a well love lady, I always enjoyed my visits with her, it was as if I was visiting an old friend. My sympathy`s to you all, She will be missed. Just read about your mom’s passing and so sorry to hear this. You are in my thoughts and prayers during these difficult days. God bless! Saddened to be reading this. Ethel was a wonderful lady who I shared many a laughs with. She loved her family very much as her stories always entailed them. Please know that I am thinking of you at this time. We are so very sorry to hear of your mom’s passing.I have fond memories of Ethel when i was a young girl.A wonderful lady who will be missed.Please except our deepest condolences.R.I.P. Ethel. To the family of Ethel ,I am so sorry to hear of your loss.She was a very nice lady.She will be missed.RIP Ethel. To the whynot family, i am so sorry to hear of your mom Ethel’s passing. She was a wonderful lady to everyone that new and loved her. My thoughts and prayers are with you at this sad and dificult time. May God Bless you. Thelma and all of Ethel’s family. May your memories and laughter be many and help you through your loss. Sincere condolences. To Ethel’s family, We were so sorry to hear of Ethel’s passing.Our deepest sympathy, thoughts and prayers are with you all.May she R.I.P. Thelma,& Family,so sorry to hear of your moms passing,Ethel was a dear sweet lady,always enjoyed our visits and had a lot laughs..she will be missed by all who knew her,my thoughs and prayers are wiyh you at this sad time. So sorry to hear of the loss of your Mother. She was so good to so many people and will be missed by all that knew her. My thoughts are with you all. I would like to pass along my condolences to all of Ethel’s family. She was a great lady. I fondly remember her visits to her sister Evelyn many years ago…they were good times. I know all of you have many wonderful memories to treasure! Larry,Phyllis,Thelma and Cory, so sorry to hear of Ethel’s passing..She was a great lady and will be sadly missed. My thoughts and prayers to the family. We were so sorry to hear Of Your Mom’s Passing. What a Special Lady She Was. I always enjoyed talking to Evelyn & Your Mom every time they were in Town. Your Mom Will be Greatly Missed By Everyone that Knew her. Your Mom is now at Peace & Free from pain. I hope that all the Beautiful memories that she has left behind for each And Every One of you Will Get You Through these most Difficult Days Ahead. May God Bless You All & May Ethel Now Rest In Peace!!! Thelma and family, so sorry to hear of your Mom’s passing. My thoughts and prayers are with the family. Treasure the memories. so sorry to hear of ethel’s passing. I always enjoyed my visits. she was a very caring lady. Please know that i am thinking of u all. will sure miss my visits always felt welcome in your home. Sorry to hear of Ethel’s passing she was a great lady and will be missed. So saddened by the news of Ethels passing. I watched the tribute video with glossy eyes,remembering the times and the people. If there is a heaven, I’m sure the voices heard there today is the gossip between two reunited sisters (Ethel and my grandmother Evelyn). Sorry for your loss. May your memories keep her in your heart and carry you through these tough times. Nan was the best nan a grandson could ask for.she allways made the best of a bad situation.she will be sadly missed.even when we did wrong she would say we couldnt do no wrong.Thanks for being there nan through thick and thin.we love you . To the rest of the family love and miss you all sorry I cant be there We are thinking of you all. Your family is in my thoughts and prayers as I extend my heartfelt sympathy on your loss. Larry and family,So sorry to hear about your MOM passing she was a great lady always was a good time seeing her ,when I came home .take care pal WAYNE . I was very saddened to hear of Ethel’s passing! I will always remember my visits to her with a smile. We had many a laugh together. She was such a lovely, dear sweet woman who will be greatly missed. You are in my thoughts and prayers at this sad time. So sorry to hear about Ethel.She was a wonderful,kind,funny lady.Kaylin adored her and will miss her greatly.Take care..thinking of you and Wade in the days ahead. We are so sorry to hear about your Mom. I remember her when I was young what a wonderful lady she was . God Bless and know that she is now home with her family to welcome her. We are so sorry for your great loss. Ethel was a wonderful caring lady who will be sadly missed and always remembered. Our thoughts are with you. The loss that you have incurred is surely a great one,Ethyl was a wonderful lady who touched the life of so many people through her love and kindness.Hold the great memories of her close to your heart,it surely makes the healing process easier! Thelma and family, I’m so sorry to hear about your mom and nan. (as Lacey called her, Nannie Ethel). She was a wonderful lady. So sorry to hear of Aunt Ethel’s passing, I have great memories of my childhood coming to her house and always was treated as a member of the family. Although I have not seen her, for a few years I still think of my family on the hill, as my mom ( Roxie ) would call it. She will be greatly missed. Thinking of you all at this time. God bless. To the family, We are so sorry for your loss. Ethel was a wonderful, loving lady who will be missed terribly. She had the best care possible and she loved life to the fullest. She often told me how she was not afraid to die, as she had 2 boys who needed her also. She will forever be your Angel and she will also look after her Family who she loved more than anything. Rest in peace Ethel, you will be remembered for a long time. Though we didn’t know your mother, Cory, by knowing you, Vinessa, Merissa and Cortney, we see how her values have influenced you all and that the memory of her warm heart; her love of life and family and her courage will always be a part of you. Our thoughts and prayers to all of you. It’s always a very difficult time when you lose a loved one. I have found that It;s a heartache that never really heals even with the passage of time. i will remember Aunt Ethel from when I was young and we went to your house to visit. She had a big family of her own but always made us feel very welcome. Even though I haven’t seen her for quite a while, I will remember Aunt Ethel as a happy person, with a big smile and never to busy to stop and have a chat. A lovely lady., always smiling and cheerful.